Does your organization handle sensitive data? Is it required to transfer these sensitive files in high volume, while complying with various regulations? 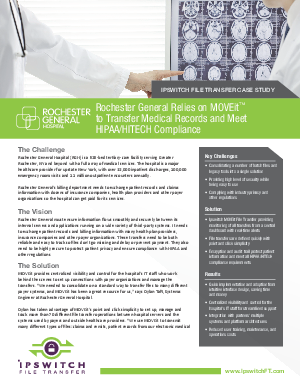 If so, then be sure to check out this detailed case highlighting Rochester General Hospital’s use of the MOVEit managed file transfer solution. See how the Rochester staff leveraged MOVEit’s point and click simplicity to set up, manage and track more than 70 different file transfer operations between hospital servers and the systems used by payers and outside healthcare providers.